A corporate relocation in New York City can be a big step for your growing business, but remember that your business wouldn’t be at this level without the team that keeps it up and running. You never want to blindside your employees with a move, so keep them posted throughout the relocation process. Ask them what they like and don’t like about the current office space so you can make the new space even better, and talk about parking and other changes that might affect their daily commute. Here’s more on how to help your employees adjust to a corporate relocation. Even if you’re staying within the same city, corporate relocation is still a big deal. This type of move is exciting, so share the news with your employees as soon as you decide it’s time to pick out a new space. It helps to be as transparent as possible throughout the relocation process. Check in with your team and let them know of any updates as they happen so they know exactly what to expect out of the relocation. If you really want to show your employees that you care about them and their comfort in the workplace, ask for their opinions during the relocation phase. 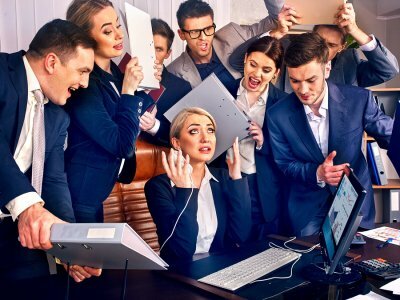 Find out what your employees liked about the office space you have now so you can carry these elements to your new space, and learn about what they didn’t like so you know what to avoid. Workers spend eight hours or more in the office every day, and you have the power to make the workday more pleasant and productive. Ask the staff how they’d like the new space to be set up, what can be done to make them more comfortable, and how you can work together to improve productivity. Change comes with the territory when you move your office, but some changes affect employees more than others. Let them know if there will be paid parking, and work with people whose commute may be affected by the move. Office Relocation is Our Specialty! If you’ve outgrown your office space, then moving can dramatically improve the way you do business. When a corporate move is on the horizon, you can rely on UMC Moving in NYC . Our skilled team of moving professionals has been managing corporate relocations for more than 20 years, and we remain committed to helping businesses of all sizes execute flawless, stress-free moves. When you choose UMC, you’ll work with a senior management team member, who will walk you through every step of the moving process. We will survey your office and inventory and create a moving timeline for your consideration. Once we begin working on your move, we’ll make suggestions along the way to cut your costs and limit downtime for your business. Our extensive moving resources mean that we have the equipment that is necessary to relocate your office efficiently and safely. Thanks to our state-of-the-art communication, we can respond to all of your queries immediately, so you can continue to focus on what you do best—running your business. During your corporate relocation in NYC , having a project team that is focused on ensuring that your move goes smoothly is extremely important. Your project team can work directly with your moving company to minimize your company’s downtime and prevent avoidable delays. Watch this video for some advice on selecting your corporate relocation project team. Your team members should have a proven track record of overseeing large projects with impeccable attention to detail and accountability. Once your team is in place, determine how often you will meet with them to discuss things like your moving calendar, packing, and transferring things like phone lines, internet connections, and utilities. As businesses grow and change, they often find themselves sitting in offices that no longer work for them. An office that is a bad fit can compromise productivity and hamper employee satisfaction, but the idea of a corporate move can be overwhelming. Fortunately, there are steps you can take to ensure that your corporate move in NYC goes smoothly and doesn’t disrupt your business. These tips will help you pull off your corporate move without causing chaos at your business. Rather than adding the task of planning your move to your plate, turn the job over to an experienced team of corporate relocation movers. By working with a company that specializes in corporate relocation, you’ll get the benefit of their experience as well as a dedicated team of people working to facilitate a smooth moving experience for your business. With your movers focusing on the relocation, you can focus on continuing to run your business. For efficient communication and planning, organize a project management team in your office to take the lead on moving-related tasks. This team can work closely with your corporate movers on creating a timeline for your relocation and executing the things that need to be done to prepare. 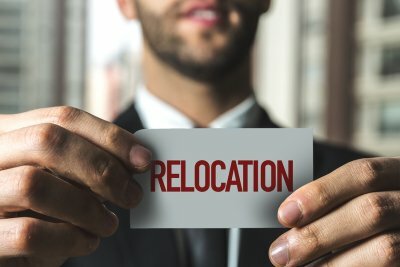 If you have a large office, it can helpful to have someone from each department of your business on the relocation team, so that they can then take responsibility for ensuring that move-related work is completed within their own departments. Determine how you will meet the needs of your customers on your moving day. This may involve leaving internet and phone service active at both locations for a period of time or allowing employees to work from home. It may also be helpful to let regular customers know when you will be moving so you can try to meet their needs before moving day. Keep in mind that employees should stay home on moving day, aside from a small number of managers. Asking employees to help while moving opens you up to insurance issues, and they can make it more difficult for the movers to do their job. Offices have a lot of stuff to move, and professional movers need to know how to get the job done without injuring themselves. Even the most fit people can suffer injuries if they don’t follow the right techniques, and this can slow down the move in addition to sidelining an employee. Watch this video on rules to help your moving team avoid lifting injuries when preparing for relocation in New York City. No matter how strong you are, you should use the right methods when lifting heavy objects. Always keep your back straight and use your knees and hips to lower yourself, rather than bending over the load with your back. Stay close to the object and use a wide stance for leverage. If an object appears to be heavier than 40 pounds, find a partner to help you move it, even if you think you can handle it yourself. If you’re moving your office to a new building , you might be celebrating a recent success that has allowed your business to take the next step forward. As exciting as this is, you need to plan your move in New York City carefully to make sure everything works out. First, you’ll need to find a viable place to move to. Then, you can look for a moving company in your area that specifically deals with corporate relocation. Finally, either you or your moving company will go back and clean up the old space. Feast your eyes on this step-by-step guide to organizing an office move. Once you have decided that moving to a new space is the right idea for your business, start looking at what’s available. It’s helpful to get an idea of what other places will cost, how advantageous the space will be, and the logistics of the move, even if you’re not quite ready to pull the trigger yet. No matter how close to being ready you are, you will need a landing spot before you can set the plan in motion. You may have worked with moving companies if you’ve moved to a different home before. Corporate location is similar, but there will be more furniture, appliances, and files to transport. That’s why you should work with a corporate relocation specialist rather than a mover who dabbles in all forms of moving. Make sure your moving services actually specialize in corporate moving, as these are the experts who have years of experience in exactly the service you need. Depending on what kind of moving services you end up using, you might be able to have the professionals go back to the old office and clean up. Your lease may require you to leave the old space in “broom swept” condition, meaning that none of your furniture is left behind. You or your moving company can go back and get rid of any file cabinets, chairs, and desks that you no longer need. If you have been considering relocation for your business, now may be the time to make your big transition. When you hire a company that specializes in corporate relocation in New York City , you will be able to easily and effectively transplant your business into its new space. By hiring moving services for your relocation, you will be able to focus on keeping your company profitable before, during, and after your move. Let’s take a look at some signs that you are ready for that big relocation. You are struggling to find qualified employees. Hiring and training a qualified workforce is an essential part of running a business. When you find that it is very difficult to source qualified candidates for your open positions, your problem may lie in your location. Moving to a new city or neighborhood will open up opportunities to draw in new members to your team. After your relocation, you may find that you have no trouble finding and hiring the right workers. You are having trouble managing your operating costs. Location can lead to higher operating costs, such as high rent or steep shipping fees. To cut down on your operating costs, think about relocation for your company. As you are seeking a new location for your business, look for a space that offers affordable rent in a good location. Once you have made your move, you are likely to find that your operating costs are more manageable. You are not reaching your desired demographic. Whether you own a retail shop, or offer professional services, it is critical to find a location that is appealing to your target demographic. If you have started to notice that you are not drawing in enough customers, this may indicate that you need to relocate your business. A savvy relocation in an up and coming neighborhood could provide your business with the boost that it needs to become highly profitable. Corporate relocation can be a stressful experience for any business. When you are counting down to the day that your movers arrive, you may find that your to do list is a mile long. Fortunately, your movers in New York City will be there to guide you throughout every step of the relocation process. By hiring a team of professional movers and packers, you can rest assured that you have made all of the proper arrangements, prior to your moving day. To help you avoid penalties or problems during your relocation, here is a look at what not to do during your office move. Whether you have a small company, or you are a member of a large organization, chances are that your office will have dozens of boxes to move. As you are packing up your office, don’t forget to clearly label all of your boxes and files. An organized labeling system will help you to easily find your essential items and papers once you are ready to unpack. Your customers will need to receive advance notification of your office move. If you forget to tell your customers in advance of your move, you may find that you have dissatisfied clients who are wondering what has happened to your old office space. At least one month before your big move, take the time to send out an email that notifies your clients of your upcoming relocation. Many office spaces are leased from property management companies. While moving your office furniture may seem like a hassle, you should never simply abandon your unwanted items in your old space. Leaving furniture behind can result in steep fines during your final walkthrough. Instead, you can ask your movers to assist you with furniture liquidation. Your liquidation will also provide you with funds that can go towards purchasing furnishings for your new office space.